For more than a decade, the algorave scene has made ravers dance to computer code. Makery went to investigate where it all began, in Sheffield, which hosted the Algomech festival in early November. Some epicenters are less likely than others; Sheffield is one of them. This city with a population of 560,000 in Northern England is known for Warp label’s avant-gardist techno and broken beat, as well as the experimental new wave of Cabaret Voltaire and Human League. More recently, musician Alex McLean has put it back on the alternative music map with algorave, a contraction of algorithm and rave, referring to the scene of artists who live code their music performances. We first met Alex McLean as his alias Yaxu, surrounded by other techno musicians at the Unconscious Festival in London. But for the Algomech (algorithm + mechanics) festival, which he organized on November 8-12 in Sheffield, McLean brought together the big names of the algorave scene—especially the local ones, “so as not to increase our carbon footprint with international flights,” he says (half) joking. On stage, Goto80, aka Anders Carlsson, Swedish musician and one of the first artists to explore chiptunes, or 8-bit music, stands behind his Commodore 64, the best-selling home computer from 1982 and one of the most popular of this first generation. He faces a robotic arm that is also playing a keyboard, created by Jacob Remin, an artist based in Copenhagen. Their set is followed by T.Y.P.E, a trio that weaves and unweaves code in a sort of battle of the programmers; Slub, a trio that includes Alex McLean; Joanne Armitage, a pioneer of live coding; and Tich, a regular on the rave scene and director of the label Off Me Nut, who came to try her hand at live coding for the first time. On visuals, Antonio Roberts, aka Hellocatfood, a new media artist from Birmingham. A few days earlier, to open the 65daysofstatic festival, McLean welcomed an experimental group originally from Sheffield, who—after composing the soundtrack to No Man’s Sky, a virtually endless generative video game (it would take a single player “500 billion years” to explore the entire game)—presented their new project Decomposition Theory, a performance created from music generated in real-time by a series of algorithms. The name algorave came later, in 2012. It was then that McLean registered the website algorave.com, indexing all the algoraves worldwide. The movement expanded, like the BYOB events for visual artists, or Dorkbot, events for “people who do stange things with electricity” born in New York and exported all over the world, including London, thanks to McLean’s tireless initiative. “Events such as TedX and Maker Faire are very protected,” he says. “To organize them, you really need to follow the rules. 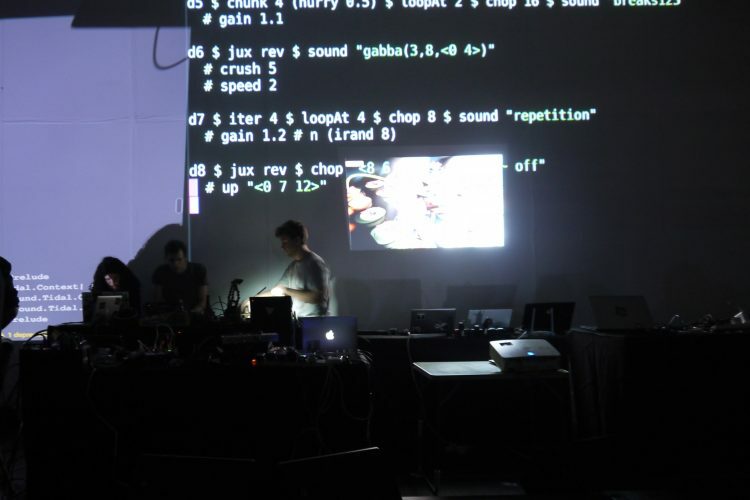 With algorave, anyone is free to do whatever they want, you don’t have to sign anything, you can use the visuals, the name.” At most, he provides consulting on how to make the program inclusive. “If you don’t start right away, it’s hard to catch up later,” he warns. In detail, live coding is like a knitting pattern, McLean explains. “We work with loops, structures that repeat.” He himself developed an open source programming environment, TidalCycles, used primarily by the algorave community. “If you work on a sequencer, you change the sound of each note, for example. With live coding, you work on a higher level, because you’re more interested in the structure behind these notes. You don’t work on individual notes but on lots of notes at the same time and the way they’re connected together.” In the background, SuperCollider, an open source platform for audio synthesis and algorithmic composition, generates sounds from commands sent by Tidal. Other live coding environments were developed by members of the algorave scene, such as Troop, developed by Ryan Kirkbride of the trio T.Y.P.E, which lets members interact with each other’s codes like a shared Google Doc, the trio explains. The open source software is available on GitHub. “Everything is based on the idea of transparency and sharing,” says McLean. During performances, the code is projected on the walls. When artists upload their pieces online, they use a format that lets them distribute the code in addition to the recording. So when Yaxu released Peak Cut in 2015, he put it on a USB stick. Currently, he’s preparing an album to be released on Raspberry Pi. At the Algomech festival, which attracted several hundred fans, McLean bridges the gap between pixels and physics. This year, a symposium on “unmaking” as a form of resistance followed conferences on maker culture from the first edition. Sunday was dedicated to workshops to make a mini battery or a musical e-textile. I've soldered and drilled for 16 hours today to get the Geophone CV generator working – playing a little chunk of #nevada. I'll be playing a gig with this is #Sheffield on Sunday at #algomech festival. The festival closed with a tribute to crazy and poetic fabrications by musician makers. Ravers could sit and admire the infernal machine of Sarah Kenchington and her mechanical orchestra, the fruit of ten years of labor and collecting strange instruments, a machine that blows into accordions by Camilla Barratt-Due and Alexandra Cardenas, or a machine that reads 3D printed records based on the relief of geographical zones from Yorkshire to Nevada by John Burton, aka Leafcutter John. Or quite simply, music explored in its many forms.